Health & Fitness Canadian babies cry more and have a higher rate of colic – but why? A new study suggests Canadian babies have higher rates of colic than in other parts of the world. What causes this mysterious condition? Colic is a vague and little-understood diagnosis given to babies who cry frequently and uncontrollably. Late into the night, Amy Ellard-Gray and her wife took turns bouncing their screaming infant daughter, trying to soothe her, but to no avail. Ever since their baby was around three weeks old, she had become increasingly difficult to pacify. By the time she was six weeks old, she cried almost every evening for hours at a time, usually from 6:30 till sometimes 12:30 a.m. She often cried inconsolably during the day, too. Worried, exhausted and desperate for answers, the first-time parents finally took their daughter to a walk-in clinic, where a doctor suggested she had colic, a vague and little-understood diagnosis given to babies who cry frequently and uncontrollably. "In one sense, it gave me relief because I knew that there wasn't anything I was doing wrong and it wasn't my fault; she was just one of those babies that cries a lot," says Ellard-Gray, who lives in Guelph, Ont. "But then on the other hand, I knew the problem wasn't solved." According to a British study, released earlier this month and published in the Journal of Pediatrics, babies in Canada cry more and have a higher rate of colic than in other parts of the world. The meta-analysis of studies involving nearly 8,700 babies found that 34 per cent of Canadian babies met the criteria for colic at three to four weeks of age. That is, they fussed and cried for more than three hours a day, at least three days a week. By comparison, 5.5 per cent of Danish babies and 6.7 per cent of German babies the same age had colic. The cause of colic is still very much a mystery, to the chagrin of frazzled parents such as Ellard-Gray and her wife. A common explanation is that colic is gastrointestinal. Changes in gut bacteria, allergies or intolerances to various compounds in breast milk or infant formula are believed to cause pain and discomfort, prompting babies to wail for hours on end. But Dr. James McKenna, a professor of anthropology at the University of Notre Dame, is proposing an alternative explanation – one that he thinks could change the way parents and doctors deal with infants who cry for no apparent reason. McKenna, director of the Indiana university's Mother-Baby Behavioral Sleep Laboratory, believes colic shares the same origins as another mysterious condition that can strike babies around the same age: sudden infant death syndrome (SIDS). Both colic and SIDS, he suggests, are caused by glitches in the development of infants' neural networks as they transition from involuntary to controlled breathing. Babies presumed to have colic don't cry because they're in pain or because they need or want anything, he says. Instead, he suggests, once they initiate a cry, a type of neurodevelopmental hiccup prevents them from stopping, and their inability to control their cries causes even more distress, and thus, more crying. The result is a heart-breaking, ear-shattering feedback loop. McKenna and his co-authors from the University of North Texas and Vanderbilt University put forth this conceptual model in a paper published last year in the journal Family Relations. Several experts, including McKenna himself, note the hypothesis is not yet tested, and thus it's not widely accepted. But it has piqued the interest of scientists such as Dr. Charles Nunn, a professor of evolutionary anthropology at Duke University, who believes McKenna may be on to something. McKenna and his team's proposal "has great potential to promote further dialogue between fields [of neuroscience, child development, anthropology and evolutionary biology], and is highly relevant to understanding and improving infant health," Nunn said in an e-mail. If he's correct, McKenna says, parents may be able to lower the risk of SIDS and reduce the duration and severity of colic by frequently touching, talking to and maintaining physical contact with their babies. Although babies have been described as having colic for hundreds of years, a formal criteria for diagnosing colic was introduced in the 1950s by the late American pediatrician Morris Wessel. Wessel came up with a definition still widely used today, called the "Rule of Threes," where a baby is considered to have colic if he or she cries for at least three hours for more than three days a week for three consecutive weeks. Colic starts in early infancy, and babies with colic typically cry most in the evenings. While parents often report other symptoms such as burping or flatulence, these infants tend to be otherwise healthy, says Dr. Michael Dickinson, president-elect of the Canadian Paediatric Society. "They're drinking, peeing, pooping, growing. You can X-ray them, blood-test them, scope them. Everything comes back normal. And yet they have this unexplained crying and irritability that drives parents crazy," Dickinson says. Dickinson understands these parents' stress and misery well, since he dealt with his own child's colic. Even though that was 20 years ago, his memories of driving a crying baby around town at 5 a.m. with no destination in mind remain fresh. Many parents try over-the-counter products, such as gripe water or Ovol Drops, but Dickinson says he generally finds these remedies disappointing and ineffective. In most cases, colic disappears around the age of four to six months, just as mysteriously as it appeared. "If you do nothing, usually by the time you get to six months, you're through the worst of it and out the other end," he says. Even in babies who don't have colic, crying generally starts to increase around two weeks of age and peaks some time around the sixth to eighth week, and declines through the 12th or 13th week, says Dr. Ronald Barr, professor emeritus of pediatrics at the University of British Columbia and a former director of research at the B.C. Children's Hospital. As such, Barr, who has studied crying patterns in typically developing infants for three decades, believes the inconsolable crying characteristic of colic is simply an extreme end of a normal spectrum. "I would argue that all babies have it, they just have more or less of it in the same way that some babies are taller, some babies are shorter," Barr says. "They all have these unsoothable crying bouts and they all have this increase and decrease in crying, which has traditionally in clinical circles been taken to mean colic." In proposing his alternative hypothesis, McKenna says he knows he's taken some "broad and new conceptual leaps," but he believes his ideas fit with the existing literature on human brain development related to breathing. As an anthropologist whose early research on primates evolved into a specialization in the sleep behaviours of human mothers and babies, McKenna was curious to learn that colic typically starts and ends within the same time frame as the risk of SIDS. He began to suspect this was no coincidence. It's during this period, he found, when babies develop the ability to speech breathe, a development unique to humans whereby infants learn how to control their breathing in preparation for speech. Up until the age of about one month, babies' breathing is involuntary, controlled by their brain stems, which is considered the more primitive part of the brain, McKenna explains. By the time babies are seven months old, however, they have typically mastered speech breathing, and are able to control the pitch, tempo and volume of their cries. Once they do, parents are generally able to associate meanings with the sound of their babies' cries. "They're able to say, 'Oh, the baby just wants a diaper change,' 'Oh, the baby just wants to be picked up' – but that doesn't actually happen until the baby is in control of the breath," McKenna says. Unlike brain-stem-controlled breathing, speech breathing is controlled by the neocortex of the brain, which is responsible for executive functions. McKenna believes inconsolable crying and SIDS arise when babies make this transition from the former to the latter. "It isn't always the case that these nerve tracts that are responsible for voluntary and involuntary breathing are really maturing synchronously and at the same rate," he says. In cases of inconsolable crying, a glitch in the development of these nerve tracts may be frustrating though harmless. But in SIDS, McKenna believes it causes sleeping babies to fail to wake up and willfully take a breath when they experience apnea, or a pause in their breathing. Because speech breathing is a learned skill, acquired through hearing other people breathe, McKenna thinks holding, carrying and otherwise keeping babies in close physical contact helps their neural networks develop more quickly and synchronously. Although this may not prevent or stop inconsolable crying, he says, it may, at least, reduce its severity and duration. 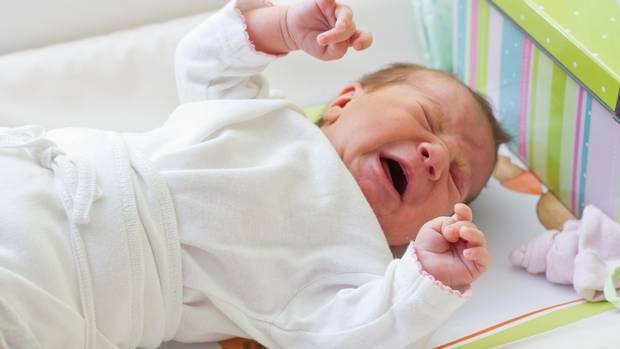 Dr. Barry Lester, a professor of psychiatry and human behaviour and pediatrics at Brown University, is not convinced there's a link between colic and SIDS. And unlike McKenna, who suggests a colicky cry is one of fear from not being able to stop crying, Lester believes babies with colic truly cry out in pain. Lester, who runs a clinic devoted exclusively to colic, diagnoses the condition not only by excessive crying, but by a number of additional symptoms, such as babies pulling their knees up to their chest, arching their backs, exhibiting tight stomachs and hypertonic or constricted muscles. While Lester says colic, in some cases, may be related to some reorganization of the central nervous system, he says he is unaware of any evidence that colic and SIDS are related. Colic, he believes, actually has multiple causes, including lactose intolerance and gastroesophageal reflux. At his clinic, Lester has found medicine and techniques for propping up babies can help in cases of reflux. But in addition to tackling the physical symptoms of colic, Lester says the clinic focuses on the relationship between the mother and child. "One of the things that colic does is that it drives a wedge into the mother-infant relationship and it blows it out of the water," he says, noting it also adversely affects the relationship between parents. "It can destroy families." Lester is skeptical of the results of the British study that showed high rates of colic in Canadian babies, noting that the data relied on caregivers' diaries of babies cries, which he says is an imprecise measure. Moreover, he adds, it did not include the other symptoms of colic beyond excessive crying. "If you're equating colic with excessive crying, then you aren't looking at colic," he says. Even so, Lester says he has noticed differences in babies' cries in different cultures. For example, he says, he noticed, while conducting a project in Mayan villages in Guatemala, that it was rare to hear babies cry. Mothers there carried their babies close to their chests, and whenever the babies stirred, they would breastfeed them. In this manner, he says, "The kid doesn't get a chance to build up and cry to be hungry." In Western society, by contrast, he says, "We teach babies to cry. 'Are you hungry? Well, let me know when you're hungry by crying.' That's what we teach them." Whether his hypothesis is eventually proven or debunked, McKenna firmly believes babies are better off when they're held, spoken to softly and nurtured in an environment for which their biology is designed, he says – "that is where all these sensory streams are available to regulate the baby's physiology." McKenna says he understands it can be difficult for parents when it feels like nothing they do helps. He was devastated when his own son had colic 37 years ago. He coped by holding his child, walking with him and dancing to Saturday Night Fever. For Ellard-Gray and her wife, their baby, who is now seven months old, eventually became happier at around four months. Although Ellard-Gray suspected their daughter might have had some kind of digestive issue or allergy, she still doesn't know what caused all the crying. She says what got her through those nights of screaming was a "maternal instinct to not just abandon your child when you're exhausted and they're crying," and the determination to take the ups and downs of parenting in stride. "My life motto became 'This too shall pass,'" she says. "Dealing with colic or dealing with whatever issues your child comes up with, you just somehow get through it."